Los Angeles, CA (July 11, 2016)—The Autry announces that it has acquired the estate of renowned Maidu/Portuguese/Hawaiian artist Harry Fonseca (1946-2006). The collection includes over 500 original works of art as well as Fonseca’s personal archive of journals, papers, and sketchbooks, most of which have never been exhibited, researched, or published. Fonseca was among a critical generation of twentieth-century Native artists who, inspired by tradition, created work that transcended expectations of the same. Best-known for his depiction of Coyote, the colorful trickster who “leaves the res” only to re-appear in a variety of non-traditional settings, Fonseca also created work that speaks to historical events such as the California Gold Rush. "In this single step, with the acquisition of the main and the most important of the works in the estate of the late Harry Fonseca, the Autry has transformed its position as a national center of collecting, researching, and interpreting contemporary Native fine art. Fonseca already is highly respected, specifically for his immense gifts as an artist and the uniformly high quality of his prodigious volume of work. In addition, twenty-first-century art history will view him, more generally, as an undeniable and valued bridge between Native art and the broader international contemporary art world. His impact on both was seminal and enduring, and, in addition, the Autry's pursuit of mission—interpreting the vast cultural complexities, past, present, and future, of the American West—has been profoundly enhanced." said W. Richard West, Jr., the Autry’s President and CEO. "The fundamental goal of the Fonseca Trust has been to locate an institution with the means, curatorship, and commitment to place the breadth and depth of Harry’s creative genius and deep scholarly approach to making art. Including a broad spectrum of the Trust’s collection— studies and sketches, finished works, sketchbooks and journals, models, papers, and even his paintbrushes and easel, we feel gratified that his artistic and intellectual legacy will be accessible for future generations to discuss, study, and appreciate in a way that stimulates and moves us all. On behalf of the Fonseca Trust and Harry's family, we thank the Autry for stepping forward in such an enormous and significant way." Born in Sacramento in 1946, Fonseca began his art career in the 1960s at California State University, Sacramento. Influenced by basketry designs, dance regalia, and his participation as a traditional dancer, Fonseca’s earliest pieces drew from his Maidu heritage. He first gained public and museum attention with his invention of the Coyote series in the 1970s. The Coyote became a vehicle for self-exploration, a metaphor for a life well-lived, and a symbol of the Native idea that the world is not to be controlled but to be enjoyed and embraced. 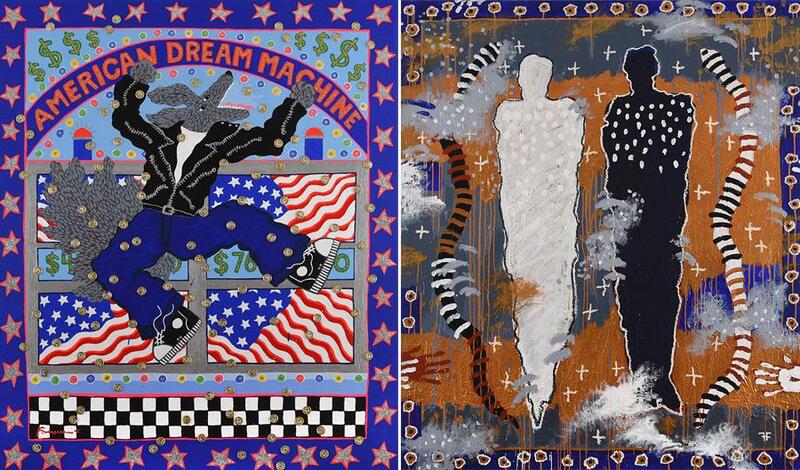 Fonseca's work later took a more political turn with the Discovery of Gold and Souls in California series in the 1990s and other series that connected to California history. Fonseca maintained a studio in New Mexico until his passing in December 2006. “The Autry has set itself apart from other museums by acquiring Harry Fonseca’s archives and original art. His work will always be relevant as he painted universal themes and issues that affect not only Native peoples but the world at large, such as Christianity, genocide, religion, greed, money, and gold. Through his art, Fonseca examined and considered the human condition, speaking directly to the challenges of life. His consistency was in the high quality of his work,” said Patsy Phillips, Director, IAIA Museum of Contemporary Native Arts. “As the largest single repository for Fonseca’s work, the Autry becomes a destination for scholars, curators, and others to study his legacy and art for generations to come." In the coming years, the Autry will develop an exhibition and publication of Fonseca’s work, which establishes a continuum between the museum’s historic, modern, and contemporary collections. During the past decade, the Autry has expanded its Native art collection through donations or acquisitions of works by artists such as Rick Bartow (Wiyot), Allan Houser (Chiricahua Apache), Virgil Ortiz (Cochiti Pueblo), Mateo Romero (Cochiti Pueblo), Fritz Scholder (Luiseno), and Preston Singletary (Tlingit). Amy Scott, the Autry’s Chief Curator and Marilyn B. and Calvin B. Gross Curator of Visual Arts, will oversee plans for related exhibitions and publications. Two of Fonseca's mixed-media works (pictured above) are currently on view in New Acquisitions Featuring the Kaufman Collection, an exhibition that continues through July 9, 2017. Several others will be included in the Autry’s expansive California Continued galleries opening October 9, 2016. “Fonseca worked to advance understanding of Native culture beyond the static and stereotypical image that often comprises the majority understanding," Scott said. "The archive presents seemingly endless possibilities for cross-collection connections, exhibitions, and research." The museum, store, and cafe are closed on Mondays.